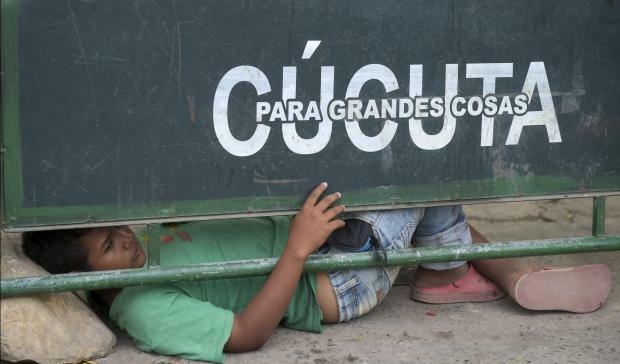 A boy rests in Cucuta at the Simon Bolivar International Bridge, on the border with Tachira, Venezuela. Venezuelans cross to Colombia to buy groceries due to the shortages in their country. President Donald Trump's administration, which has insisted that "all options are on the table" - has frozen the accounts of Venezuelan leaders and unveiled fresh sanctions to bar Maduro from accessing revenues from oil his country sells in the US. More than 80% of medicine and medical equipment are missing in a country that has the world's largest proven oil reserves, according to the pharmaceutical federation. There are constant cuts of basic services such as water and electricity. The anti-Maduro camp has also denounced the regime's decision - while Venezuela grapples with such a dire situation - to send 100 tonnes of humanitarian aid to Cuba to assist the communist island in the wake of a recent hurricane.